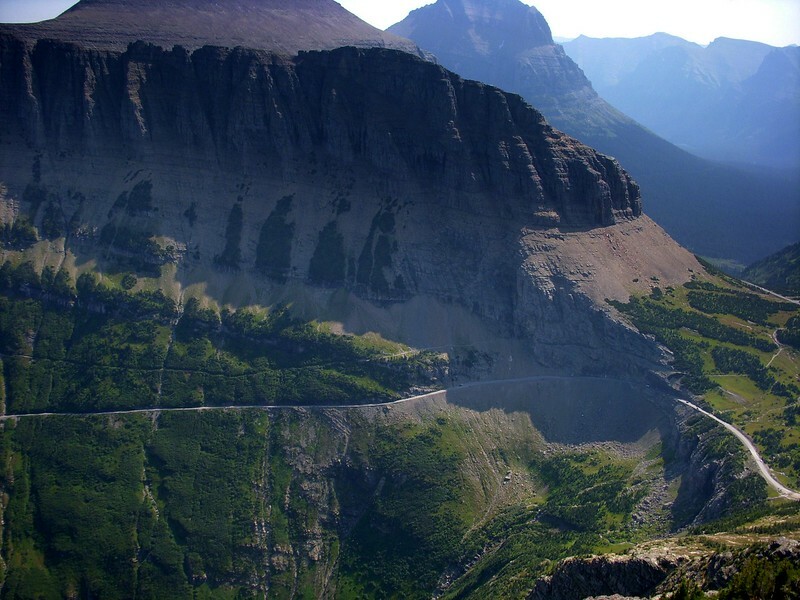 Mount Oberlin sits just northwest of Logan Pass in the center of Glacier National Park’s heavy tourism zone. 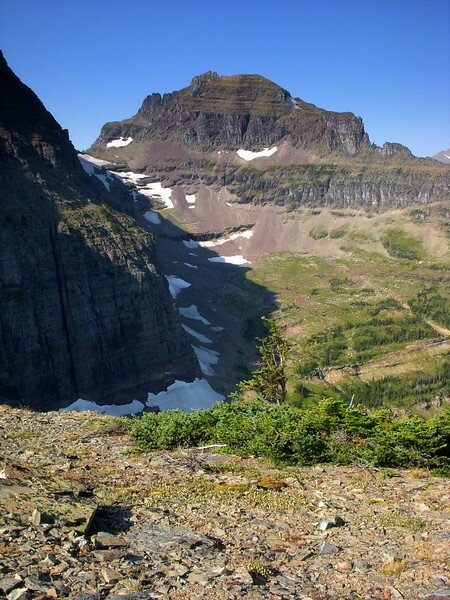 It’s billed as the easiest “real” (meaning you have to register with the rangers) climb in the park but barely makes it to Class 3 in just one or two spots. But if you only have a short time in the park, yet want to do a short hike/scramble (2.5 miles roundtrip; 1,500 feet of elevation gain) with amazing views (and away from the crowds), then Mount Oberlin is it. 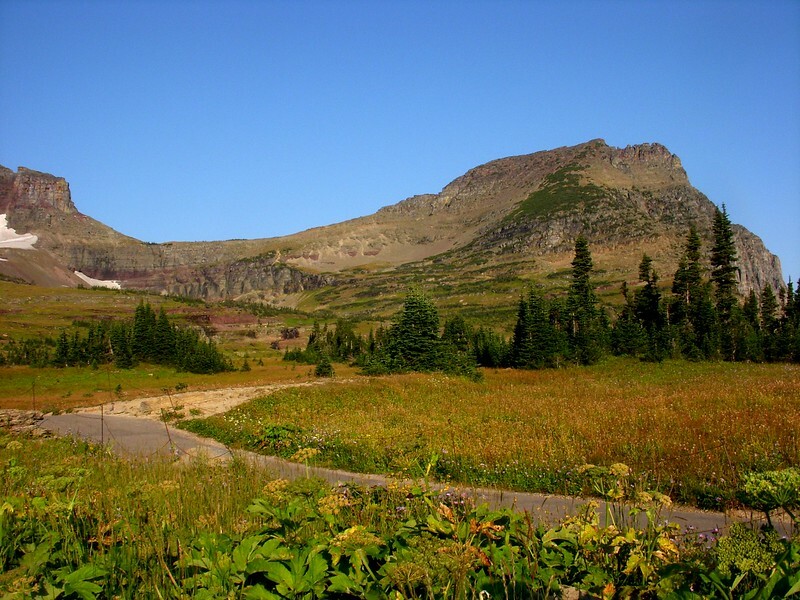 The use trail leaves Logan Pass from the curving ramp between the lower bathrooms and the upper vistor center (and NOT from west of the visitor center as some guidebooks imply). It crosses about a mile of open meadows before climbing not too steeply up open ground to the saddle between Mount Oberlin and Clements Mountain. You then follow the ridge north to the summit. Along the way across the meadow towards the saddle, we encountered a huge marmot sunbathing – which, at a distance and with our heightened sense of bears, we thought WAS a bear. From the Clements-Oberlin saddle, we had a great view of the park’s west side, including the 3,000-foot face of Mount Cannon. From the saddle, we scrambled about 500 feet up and 0.25 miles north to the summit. The route is well marked with cairns – in a few places we had to use our hands and feet and there is one slightly exposed step-across, but there is no real 3rd or 4th class climbing as some guidebooks suggest. 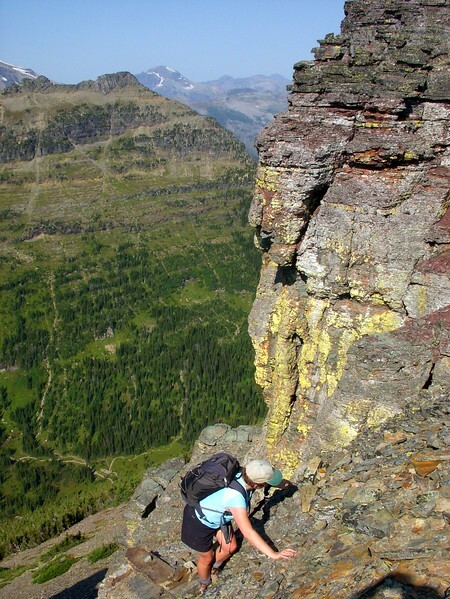 It’s no more complicated than Munra Point in the Columbia River Gorge, only higher (7,500 feet) with much bigger views. 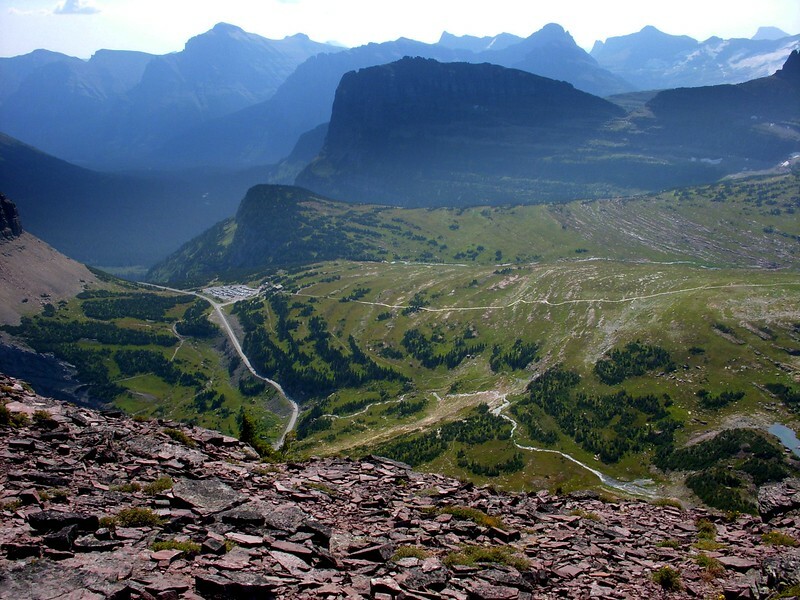 From the summit, we could look back (southeast) toward Logan Pass with its now full parking lot – it’s always a bit of a tourist zoo since it’s right on the immensely popular Going-to-the-Sun (G-T-S) Highway. We could also look directly east at the Garden Wall, which is cut by the G-T-S Highway (lower cut) and the Highline Trail (faint cut above the highway). 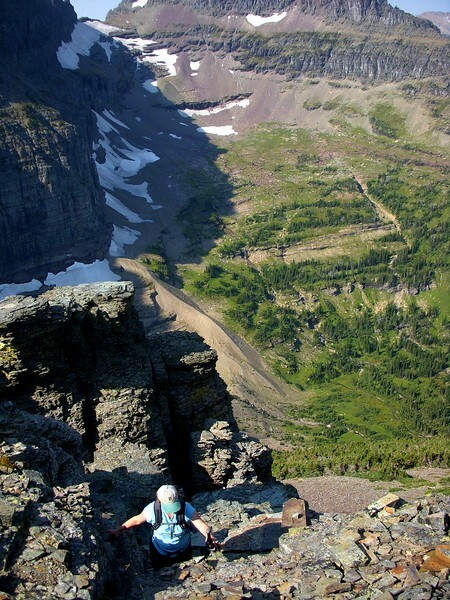 There’s no other place where you can get this view of the entire Wall and of the Highline Trail – a very popular hike. From the summit, we had the option of either returning back down the ridge or dropping directly down a well laid-out use trail that bypasses the ridge altogether. We opted for the bypass route. From the bottom of that, it was a pleasant stroll back to Logan Pass. Our whole adventure, including a snack break and numerous photo breaks, took four hours. 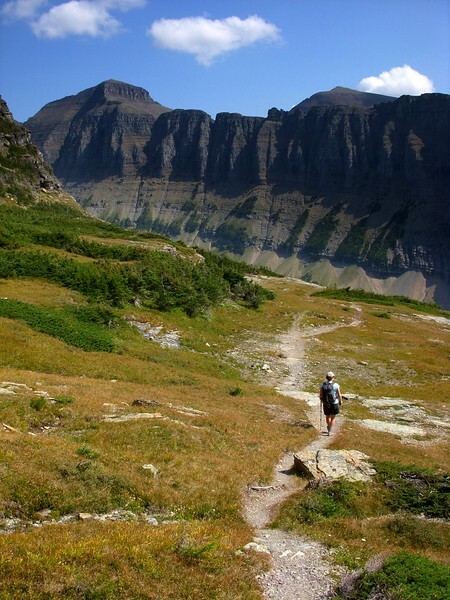 It’s short, but all above 6,000 feet, so if you’re not acclimated, it could take longer.